This Vesteva Cape Coral Vacation Rental Home looks like a model home! Stunning open floor plan makes this home light and bright, this was a custom built home by the builder and he lived in the house himself prior to selling it. Chef’s kitchen with stainless steel appliances, 42” cherry cabinets, granite, and more. Custom heated pool with waterfall and salt-water filtration, over sized pool deck, exquisite tray ceilings with crown molding, plantation shutters and lush landscaping with gorgeous mature palm trees. The master bathroom offers a large walk in shower with a separate soaking tub. The NW area of Cape Coral features great boat access to the Gulf of Mexico, beaches and surrounding islands such as Cayo Costa, Cabbage Key, Sanibel & Captiva. Championship golf courses are only a short ride away. 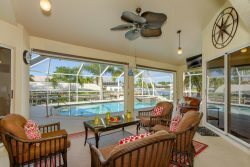 Neues Listing eines Cape Coral Ferienhauses. Dieses Ehemalige Model Home wurde sehr hochwertig und mit viel Liebe zum Detail gebaut. Hohe Decken mit tollen Details, viel natuerliches Licht. Die Kueche ist sehr hochwertig ausgestattet mit Edelstahl Kuechengeraeten, Granite und hohen echt Holz Schraenken. Der Salzwasser Swimming pool ist elektrisch beheizt und bietet einen Wasserfall. Das Haus bietet 3 Schlafzimmer, 2 Baeder, und eine ueberdimensionale Terrasse zum sonnen baden und relaxen. Das Master Badezimmer verfuegt ueber eine grosse begehbare Dusche, eine Badewanne sowie 2 Waschbecken. Das Haus liegt an einem Gulf Access Kanal mit zugang zum Gulf von Mexico sowie die vorgelagerten Inseln Cayo Costa, Cabbage Key, Sanibel & Captiva. Exceptional property for a relaxing, luxurious holiday.